Where can I find mountain gorillas? Half of the Mountain gorillas are located in the Virunga conservation area. This area covers Uganda (Mgahinga Gorilla park), Rwanda(Volcanoes National Park) and DR Congo(Virunga National park). The other half is found in Bwindi Impenetrable National Park in Uganda. What is the cost of Gorilla trekking in Uganda? The cost of gorilla trekking safari depends on the accommodation you are willing to book and also the activities you would like in addition to Gorilla trekking. What is the cost of Gorilla trekking permit in Rwanda? The cost of the gorilla permit in Rwanda is $1500. Does the rain affect gorilla trekking? Whether it rains or not, gorilla trekking will take place. However it is recommended to carry rain gear and trekker shoes so that movement becomes easier. How long does it take to meet the gorillas? Gorilla trekking can take a period of 30 minute to 8 hours. This depends on the location and movements of the gorillas. What is the maximum number of people on a gorilla trekking group? A maximum of 8 people in a group are allowed to trek and meet the gorillas. How much time do I have when i meet the gorillas? When you meet the gorillas, you are allowed a maximum of 1 hour. You can take pictures however, note that flash is not allowed. You are allowed a distance of 7 meters in presence of the mountain gorillas. You are not allowed to touch the mountain gorillas though there are rare cases when the gorillas touch humans. When this happens, you should not panic and you should know that the gorillas are always in control. These animals are very gentle and they seem to ignore tourists in their presence. However, do not take this for granted. You a not allowed to make any rush movements, do not block the way between a mother and baby. How physically fit should i be before trekking? How can I ease my self during gorilla trekking? In case you want to ease your self, you should dig a hole of about 30 centimeters deep, and then cover the hole right after. 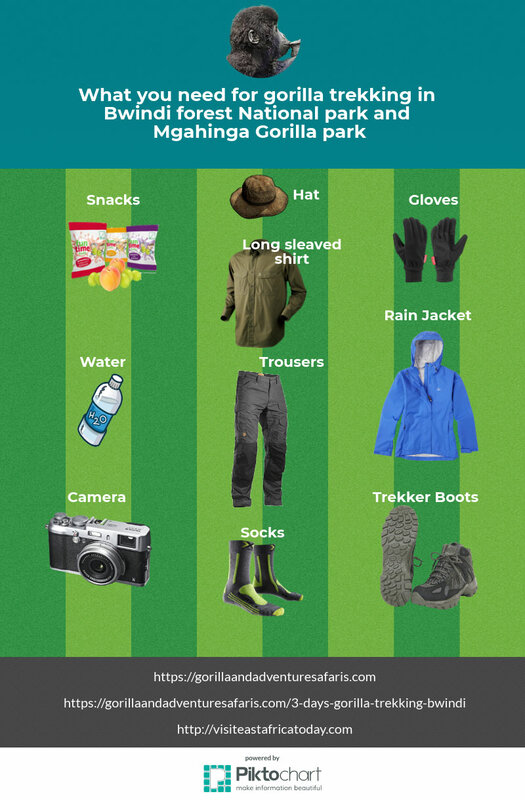 What do I need to pack for trekking? Trekker shoes: You will need good waterproof comfortable shoes. Some times it rains during the trek, so skid proof shoes can come in handy. What are some of the Gorilla trekking safaris that you offer in Uganda? We have a wide range of safaris and these are some of them that you can chose from. After the time with the gorillas have elapsed, still keep the voices low until you are about 200 meters away from them. There are several lodges and hotels near the Gorilla parks. You chose to stay in any of these lodges. The choice of the lodge depends on you budget. The lodges range from Budget(shoe string) to Luxury(Upmarket). Here is a list of some of the specialty lodges in Bwindi National park.